The science behind long, happy and healthy life is continuously emerging. The maximum lifespan of human being is about 120 years. How to increase that? How to add more life into these years? How can we preserve our youth? What cause aging? Can human bodies become immortal? These are the most fundamental questions in biology. Aging is almost universal, but the causes of aging are complex. The rate of aging also differs from person to person. Scientific evidence suggests that meditation, yoga, proper diet, regular exercise, regular learning and calorie restriction, during middle age and beyond is enormously effective to promote health and disease free life. Through disciplined life, it is possible to make the rejuvenation and extend lifespan. It is possible to achieve stop senescence, reverse aging or at least significantly delay it. 1. Genetic program: Some theories see aging as the result of an internal necessity, such as a built-in genetic program that proceeds inevitably to biophysical aging, or senescence. The cellular theory of aging argues that aging ultimately results from this progressive weakening of capacity for cell division. A growing body of evidence demonstrates that telomere shortening is the ultimate trigger. Telomeres, it seems, comprise a biological clock marking the unique age of a cell as it divides. A telomere is a repeating sequence of DNA at the end of a chromosome. Each time a cell replicates and divides, the telomere loses some of its length. Eventually the telomere runs out, and the cell can no longer divide and rejuvenate, triggering a poor state of cell health that contributes to disease risk and eventual cell death. Balance is very important—neither too high nor too low levels of telomerase are good for cells. 2. Damage cells: Some theories see aging as the result of external events, such as accumulated random negative factors that damage cells or body systems over time. For example, these factors might be mutation or damage to the organism from wear and tear. Among the damage cell theories the “free-radical theory of aging” is most popular. Free-radical theory has prompted some to believe that consuming antioxidant substances, such as vitamin A,C, and E, might retard the process of aging. 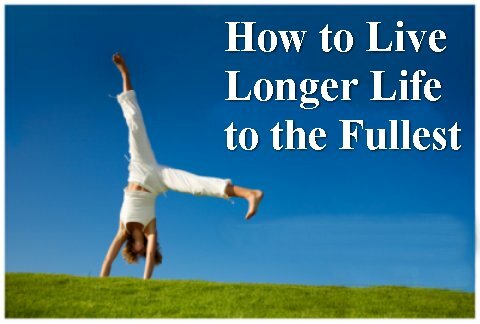 We recommend the following fifteen ways to increase your lifespan. Go for a walk – Have a brisk half-hour walk three times per week OR get a pedometer and walk 10,000 steps per day. Do free hand exercises. Exercise maintains healthy blood vessels for good circulation in the body and brain. It also helps people manage their weight and cope with stress. Eat grapes and blueberries. Resveratrol is available on the skin of grapes, blueberries, raspberries, and mulberries. Eat more fish – Fish contain omega-3 and omega-3 fats lower the risk of heart attacks. Lift weights – muscle and bone loss could be stopped and even reversed through weight training. Take vitamins and minerals – Zinc, Magnesium and Vitamin E, B12 deficiencies can result in dementia and memory loss, so make sure you’re getting enough vitamins and minerals. Challenge your mind – Stimulating mental activities, such as learning a foreign language, reading a challenging book, playing bridge. Be positive and optimistic. Positive mentality reduces stress hormones. Spend time with friends – social engagements add much to your life span. Be physically active – Do not spend sitting at your desk for more that an hour. Get up and move every hour, even if just for a minute. Eat Nuts – Nuts are high in vitamin E and reduce oxidative stress in your arteries. Sleep well – Sleep nourishes us at the deepest cellular level. Drink enough water – Without an sufficient intake of water our cells become dehydrated, malfunction, and eventually die resulting initially in bodily discomfort and eventually in pain or disease. Live for others. Caring and helping others is important, but caring for yourself is important, too. Smile – When you smile, you will be happier. Smile is not restricted to our face or brain—there are parts of our bodies that help and reinforce the feelings. Preserving the telomeres length is an exceptionally important principle of health. Those who can maintain the telomeres will be rewarded with a longer lifespan and better quality of health as they age. Research observed that psychological stress—both perceived stress and chronic stress—is significantly associated with lower telomerase activity and shorter telomere length. A diet based on starchy foods such as bread, rice and pasta; with plenty of fruit and vegetables; some protein-rich foods such as fish and lentils; some milk and dairy foods; and not too much fat, salt or sugar, will give you all the nutrients you need. Meditation have effects on telomere length by reducing cognitive stress and stress arousal and increasing positive states of mind and hormonal factors meditation promote telomere maintenance. Aging is a physical phenomenon happening to our bodies. One day it will be possible to repair all the types of molecular and cellular damage that happen to us over time and that will give people the chance of more life. This entry was posted in Articles, Brain Research, Health, Immunity Research, Longevity Research, Science of Happiness, Well-Being and tagged Aging, cellular theory of aging, free-radical theory of aging, Fullest living, increase lifespan, life expectancy, lifespan, Longer Life, Meditation Telomeres, Resveratrol, Telomeres. Bookmark the permalink.